When will the craft beer industry crash into that ceiling? It’s been a wild ride so far in the American beer market over the last few decades, but it can’t last forever. 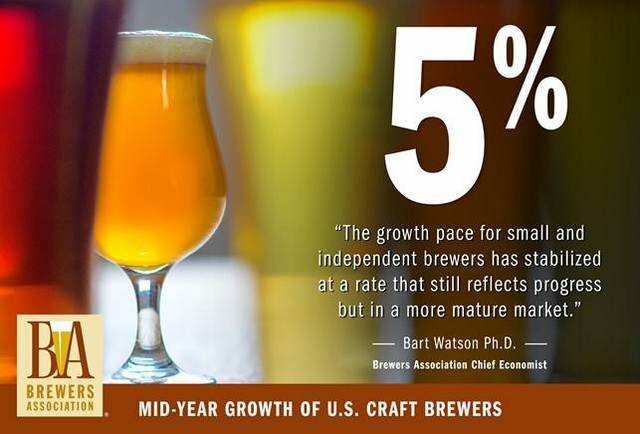 In 2013, small and independent brewers saw a mind-blowing 18 percent rise in volume, but by mid-year 2016, that growth by volume had slowed to 8 percent. Now, the Brewers Association (BA), the not-for-profit trade association representing craft brewers (they have a definition for craft), has announced American craft beer production volume increased 5 percent during the first half of 2017. Competition is absolutely bonkers right now. As of June 30, there were 5,562 operating breweries in the United States, an increase of 906 from the same time period the previous year. On top of that, there are approximately 2,739 breweries in planning. Holy crap. Luckily, 5 percent is still decent growth. And craft brewers should be pretty proud — especially considering they currently employ an estimated 128,768 full-time and part-time workers in a variety of roles, all of which contribute significantly to the U.S. economy. Cheers, folks.